What is a Yoo-Mi PHA? Our Yoo-Mi Personal Health Assistant (PHA) is a virtual personal assistant powered by cutting-edge Artificial Intelligence that’s deeply rooted in psychology. This pioneering branch of AI gifts our avatar with the unique ability to assess, understand and empathize with people as individuals, and to effectively nudge users towards positive lifestyle choices. What can a Yoo-Mi PHA do for me? Through a combination of sophisticated psychology and powerful algorithms, your Yoo-Mi PHA will continuously digest the intricate information it needs about you to encourage, motivate and educate you to become the best possible version of yourself, while providing personalized tips and 360° insights into your progress. No two avatars ever look or behave the same, as indeed no two people ever do. Underpinning the Yoo-Mi PHA avatar is our comprehensive marketplace that caters to all the wellness needs of our users. The marketplace uses Blockchain to provide direct access to entities that facilitate every wellness need. The entire Yoo-Mi PHA marketplace operates using our dedicated UME currency. How does the Yoo-Mi PHA work? Our empathetic artificial intelligence is the secret sauce that gives every Yoo-Mi PHA the empathy that until now wasn’t achieved by any AI company trying to create the ultimate AI assistant. Yoo-Mi PHA is powered by ground-breaking technology that will use unprecedented analysis of users’ mobile meta-data to make a detailed, hyper-accurate assessment of their unique personality, including interests, traits, triggers, predispositions and internal motivators. The avatar also assesses your physical well-being through uploaded blood test results, blood pressure readings, physical tests, nutritional and exercise diaries and other wellness indicators that are easily uploaded onto the platform. The Yoo-Mi PHA combines a deep understanding of your behavior and persona with knowledge of your physical well-being to create hyper-personalized guidance and insights. The advice offered by the Yoo-Mi PHA is the product of intensive consultation with health experts and is in line with official guidelines from the World Health Organization. The entire Yoo-Mi PHA platform is operated in alignment with the strictest regulations of both the European Union and the USA. The Yoo-Mi PHA is able to motivate you through the continuous absorption of information around your personal traits and physical progress. The sensitive nature of this personal information, such as test results, internal motivators and behavioral changes, necessitates the strongest security measures and encryption methods. Storing data on the blockchain decentralizes personal information and ensures it is not held by any external entity. We will use blockchain to disclose all the properties of each product we offer, including features, ingredients, quality standards, and pricing structure. All suppliers will also have to submit detailed and substantiated information about their products and services, which will be verified and published on the blockchain. Using traditional settings for global money transfers would require a massive legal and accounting team to create worldwide access to Yoo-Mi’s products and services, not to mention the funds needed to pay processing fees. Smart contracts will be used to distribute tokens among our users based on their successful completion of wellness-enhancing actions. Smart contracts enable us to calculate the number of tokens users should receive and give users the location of the 50,000 tokens distributed daily. Users can also receive 15% cashback on products and services purchased on the marketplace if they pay with UME tokens. Tokens can be earned by suppliers as a reward for offering competitively priced products and services to Yoo-Mi PHA customers. The top five sellers on the platform will be rewarded with UME tokens via Smart Contracts. There are several benefits to establishing a new token. Due to strict regulations around privacy and security, health data will need to be run on a dedicated Blockchain system. Other currencies, like Ether, would not be able to function appropriately with health data due to its openness and lack of governance. In order to reward our users and execute micro transactions, we need to minimize transaction fees. This issue is resolved by using a dedicated blockchain. Reward consumers for using the UME platform and for following the instructions of PHA. Provide a transparent compensation mechanism with suppliers of services and products. Provide an efficient solution for transaction fees. 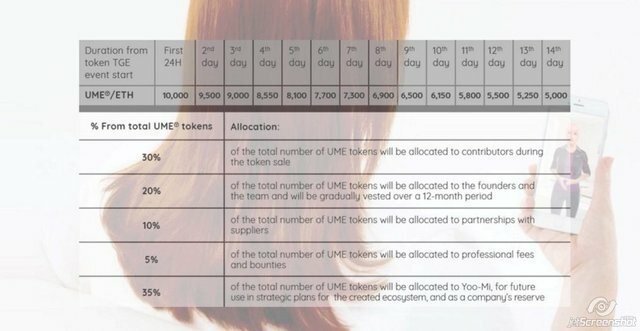 To finance Yoo-Mi PHA’s further development and future activities, we plan to conduct a token sale of an initial supply of UME tokens. How long will the TGE last? The sale event will last up to 14 days, ending on the 8th April 2018, with a capped amount of $75million. UME tokens will be sold at a fixed price denominated in ETH and the initial supply will depend on the quantity of UME tokens sold. What is your pricing structure during the TGE? In the pre-sale, we will accept large-scale wire transfers, Bitcoin and Ethereum. During the TGE we will accept Bitcoin and Ethereum. When will the contributors get their tokens? We have scheduled contributors to receive their tokens on April 8th 2018. What will happen if we do not reach our hard/ soft cap? We have already surpassed our threshold minimum of $20m. We will maintain a hard cap of $100m.